After two weeks off honeymooning (and then another week being sick) it’s nice to be back on life.remixed! Coming up over the next few weeks I have up my sleeve some interesting blog topics that I have been thinking about in my absence. While Jerry MacGuire may have screamed this now-iconic quote down the mouthpiece of a telephone as his cocky client bounced playfully on the other side of the line whilst encouraging him to say it “Louder Jerry!” the truth is that in the end it wasn’t the money which was important. It was family, relationships and even professional ethics that came out on top at the end of this classic flick named after its main protagonist. The following post is a collaborative work between myself and Greg Attwells. In a bit of an experiment we decided to write a blog post over successive emails. Here is the result. 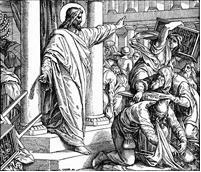 Many people have made the point in the past that Jesus did what he did in the Temple because he was reacting to the corruption of the Temple’s marketplace. This is, in a very real and major sense, true. But the issue was not so much that the Temple marketplace was unfairly trading sacrifices for exorbitant amounts of money, but more that the entire Temple system was unjustly exploiting the poor and marginalised, and excluding Gentiles and other people who were deemed “out of covenant” with God. In this way the religious system of Israel had itself become exploitative and exclusive, much like the Roman Empire that it claimed to despise, under which she herself was a victim. The very imperial system to which Israel herself was prisoner had become the system that she began to imitate. This was especially true of the religious aspect of her society. Imperial religion… how very frightening. In saying this, the money changers in the Temple had a very valid reason to be there. There was a genuine need for currency to be converted in order for tithes and offerings to take place as was custom among the Jewish people for centuries. On top of this, the people selling livestock had an even more important reason to be there – try travelling a great distance on foot and keeping your goat ‘unblemished’ at the same time! It was a system that could potentially aid the people. It made sense in their culture… it wasn’t inherently corrupt. Before you can build & plant you need to uproot, tear down & overthrow the things that will eventually kill what needs to grow. What Jesus is doing here is planting the seed of a Kingdom, one that simply cannot grow in an imperial religious industry like the Temple system had become. The Temple’s gone but the system remains. To America’s credit they are not the first to industrialise religion. It was happening in Jesus’ day; people earned a living from selling religious goods and services. However, we’re sure many entrepreneurs throughout history would stand in awe of some of the ’empires’ created by Christian men and women in our world today. Let’s be honest, Christianity has in many places become the business of selling Jesus (or maybe a pale representation of the real first century Jewish peasant), and the only ones really buying it are Christians themselves. Let’s just imagine for a second that we lived in a world where famous Christians don’t travel on private jets – they get to places the way normal people do. In fact, all ministry efforts (including Christian resources) are gifts shared between believers. Books don’t have price tags, speakers don’t have ‘appearance’ fees, pastors actually serve people and not vice versa, and the body of Christ freely gives and it has freely received. 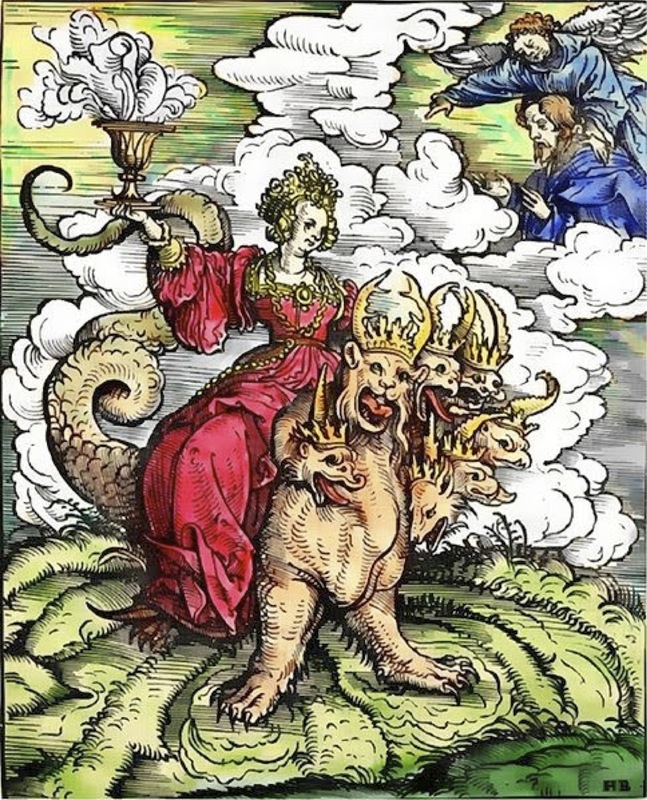 Of course, you’re going to have ‘famous’ Christians no matter what – it’s the nature of the beast. Jesus and Paul were both known throughout the land; still they looked very different from many of the ‘famous’ Christians of our day. Jesus travelled the way normal people did back then – on land he walked, and by sea… well admittedly he walked then too. 🙂 He wasn’t chauffeured around from city to city by a chariot, and when Jerusalem threw a parade to honour him he rode in on a donkey. He didn’t charge people entry to listen to his sermon on the mount, and Paul didn’t charge the Corinthians $12.95 each for a copy of his letter. They demonstrated the Kingdom in both their ministry and the systems that supported their ministry. Sure they received donations and offerings, but the point is they never charged… they never turned their gifts and teachings into products. We realise by saying all this we may be on a fast road to making many enemies. We have many friends and admire many people who sell their resources, charge for their time and make money off their ministry gifts. We love and respect these people, some of whom we could only hope to become half of who they are. Many of these folks give much of the income they earn away to various ministries and charities. These people really are amazing and we want to honour them and the contribution they are making to the Kingdom of God. The system that supports them is flawed and needs to be questioned and reformed. Please understand us; we are simply saying the system is flawed – We’re not attacking the people it supports. The fact that Jesus overturned the tables says to us he was more interested in uprooting the system that supported what the people were doing, not the people themselves. Jesus may have cleared the Temple but the money changers have returned, and my generation has inherited an imperial religious industry far more advanced and insatiable than its predecessor. Those who feel compelled can’t simply start overturning tables at their local Christian bookstore and expect to reform the system (if you decide to do this then let us know because we’d love to watch). We are dealing with an empire. It won’t treat insurgents and radical thinkers very well. It never has. It may even crucify them. The way we speak communicates our message just as much as what we say. We cannot sell the kingdom of God in a religious marketplace and expect to retain the integrity of its message. 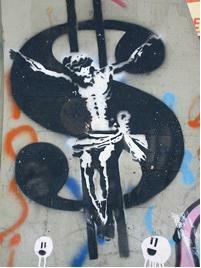 If you cannot serve both God and money, why do we think we can offer God in exchange for money? Do we imagine we can control God? 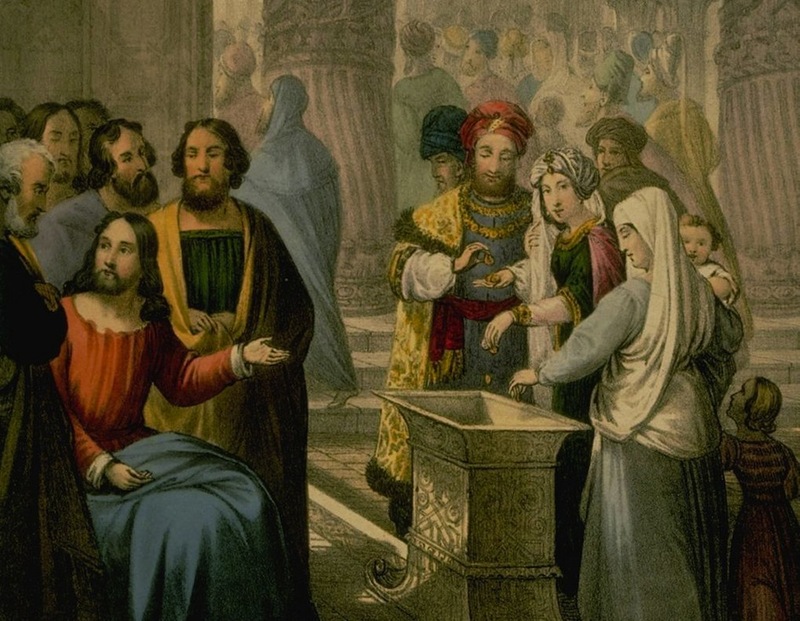 The Temple system of Jesus’ day economically supported an aristocracy of 2-3% whose affluence came at the cost of the lifestyles of peasants who made up 90% of the Palestinian population. The comparable problem with the contemporary industrialisation of the Christian religion is not that people earn money from it per se, but rather that Christians unquestioningly engage in the capitalist enterprise without ever challenging it, or the tyranny it creates for the majority of the world’s population. Thus the religious empire actually undermines the very thing it is trying to sell – the good news of the kingdom of God. This is because the empire/kingdom of the marketplace that supports the elite and exploits and excludes the remaining majority actually competes with and opposes the empire/kingdom of God which seeks a different reality. In Jesus, God kicked off that grand plan called the kingdom which rejects the imperial systems of the world and offers a totally different kind of empire – one of love, equity, justice, peace and mercy. Strong words… Much stronger than our own.